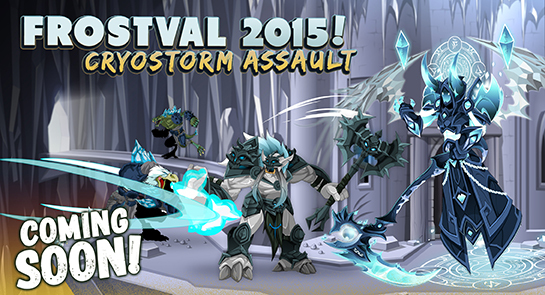 Fear the Fallen this Frostval... because WAR is coming! Frostval is the season of hope and joy, a celebration of light and life. But this weekend, we return to Drakonus as the Queen of Monsters' icy General, Karok the Fallen, disobeys her orders and begins hunting for the new Champion of Ice. If he can destroy him before he unlocks his powers, he will be... UNSTOPPABLE! This weekend, /join cryostorm to help the villagers of Cryostorm prepare for Frostvale. But beware, because Karok and the Frostspawn Horde are marching across the face of Snowspire Peak, and and this little town is right in the way of their warpath!